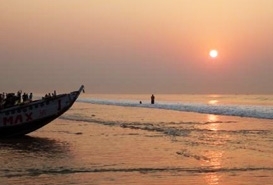 Clean sands, turquoise waters, sun, and cool breeze are typical to the Konark Beach, Konark. 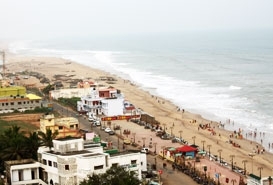 It is regarded as one of the finest Beaches in Konark and is also popular the world over. It is located at a distance of 3 km from the well-known Sun temple. 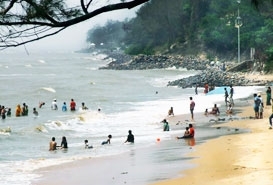 This famous beach draws lots of tourists every year not only from India but from all over the world. 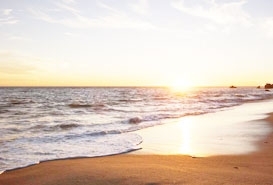 If you are on a Tour to Konark then you must not miss out on Konark Beach, Konark, as a visit to this heavenly tourist attraction is going to enchant you and give you the pleasure of a lifetime. The beauty and charisma of this place is simply beyond compare. The lengthy stretch of sylvan sands and soothing blue sea rushing in, in undulating waves makes the Konark beach in Orissa one of the most lovely places to unwind after a frantic sightseeing schedule. The water adventure lovers are surely going to love this place as it offers ample scope for water sports activities. A casual stroll along the beach with the cool sea breeze blowing gently would make for an unforgettable experience for the tourists. As Konark Beach, Konark is located near the Sun Temple the tourists can also pay a visit to this famous architectural splendor. The natural surroundings around the beach are quite apt for relaxing and a good resort for an intimate escape, away from the rush of the city. One need not worry about the accommodation as various options for accommodation are available in different categories and ranges. The most favorable time to visit Konark beach would be in the winters since the temperature varies from 27°C and 16°C, and is a pleasant one for spending the vacations. So, in these holidays Konark Beach, Konark is your calling. Just don't miss the fun!